Wildfire season can be a disappointment to those who love being outside. Here's how to cope when your need for nature conflicts with weather advisories. Wildfires in British Columbia have us coughing here in the Pacific Northwest. But outdoor adventurers, runners, bicyclists, and anyone used to frolicking outside might be getting antsy after a few days of bad air quality. And while members of sensitive groups — including kids, older adults, pregnant women, people with breathing or heart problems, people with diabetes, and people who have had strokes — should adhere to safety guidelines set by air-quality forecasters and public-health officials, bad air quality doesn’t necessarily have to mean you’re restricted to the treadmill or stationary bike. Just remember to use your best judgment, monitor air quality, and talk with your doctor. 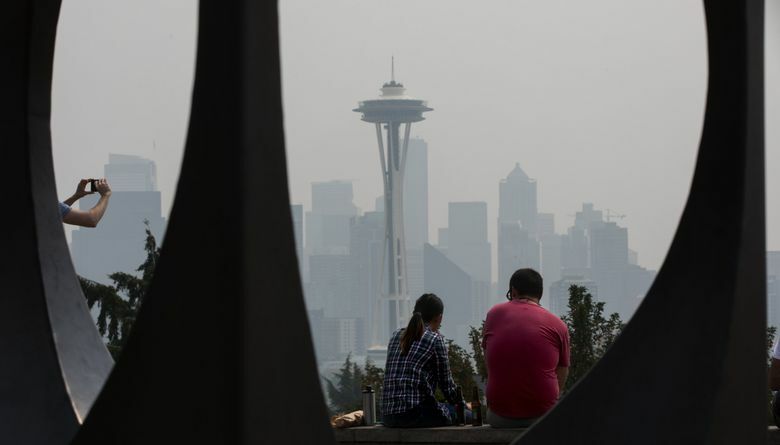 We spoke with forecaster Erik Saganic at the Puget Sound Clean Air Agency (PSCAA) to find out how you can enjoy the great outdoors when the air quality isn’t so great. Here are his tips for going outside on poor air-quality days. If your county is experiencing particularly bad air quality, keep an eye on the Current Air Quality Network Map, updated every hour, to plan your run or other outdoor activity for when air quality will be improved. When the air quality is poor, keep your activity to levels that don’t increase your rate of breathing too much. Think yoga, walking and tai chi. If the air quality isn’t too bad and you absolutely must go on that hike or bike commute, try wearing a mask. The only mask that the PSCAA recommends is the N95- or N100-rated masks. You can buy them at a pharmacy or hardware store. Saganic warns that people should be wary of special bike or running masks, since they may not protect you as advertised. So if you’re considering a mask, check with your doctor before you try it out. Generally, winds are stronger on or near Puget Sound, says Saganic. That generally means that the air quality is a bit better near the water, so activities like sailing or kayaking might be worth a try if the elliptical just isn’t doing it for you anymore. Scuba diving might just be the safest outdoor activity for bad air-quality days. Finally, if all else fails, you might need to get out of range of the wildfire smoke. The PSCAA does not recommend driving, but if you just have to get out of the house, one option is to check the air-quality map and see if you can hop on a ferry for a run on Bainbridge Island. If you absolutely must drive, make sure to keep your car’s recirculation button on. Crystal Paul: cpaul@seattletimes.com; on Twitter: @cplhouse. Crystal Paul is the travel and outdoors reporter at The Seattle Times. She is interested in stories about the people, places and histories that capture the soul of their communities.